When we drove to Utah a few weeks ago, I had to stop at the Williams-Sonoma outlet on the California-Nevada border. Overall I was underwhelmed, but I did walk away with a few goodies that make me happy! My first find was this adorable mixing bowl. This bowl has brains and beauty. I love the pouring feature, there are measurements on the inside, and the bottom has a rubber ring so it stays put on the counter. I was drawn to the bowl because it reminded me of the white and red Tupperware mix-and-pour bowls that my mom and Grandma have used for AGES. My new bowl is, ironically, more retro looking than my mom’s actual retro bowl. Funny! Anyway, my sister used the bowl this weekend and agreed that it is very lovable. 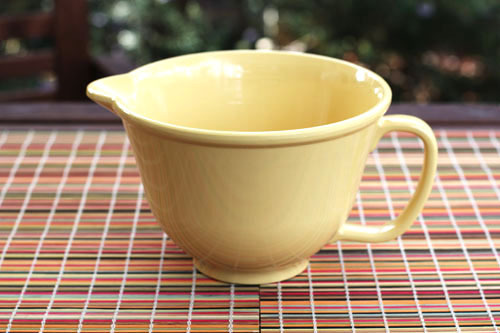 I found a similar bowl on the Williams-Sonoma websote, if you want to check it out. Lucky for me I only spent 10 bucks. Woohoo! Third, I bought rubber gloves. I have never owned rubber gloves. I had been thinking I should get a pair, so when I spotted these cute pink ones at the outlet, I grabbed them. And I am ambiguous about their existence. I like them in theory, but honestly, I feel like my hands turn into horses hoofs when I put them on. I feel so clumsy! How about a fun little side story about my clumsiness? A few days after I bought the gloves, I sliced my finger on my new KitchenAid food processor reaching in to move the mushrooms around. (Rookie mistake that I’ll never make again.) I thought, “Good thing I have these rubber gloves so I can still do dishes!” and then started to do the dishes and proceeded to fill the glove of the injured hand with water when reaching into the sink for a dish. (Another rookie mistake I’ll never make again. Apparently reaching for things is downright dangerous.) ANYWAY…back to the topic at hand. I want to pose the following question. 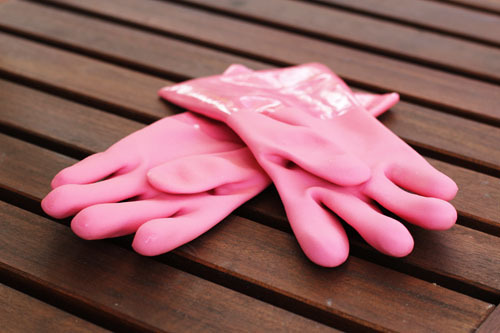 Rubber gloves: love ’em or hate ’em? I’m wondering if I just need practice, or if they’ll always just be annoying and used only for “special occasions” (i.e. slicing off the top of your finger). Share your feelings! I want to know what you think! 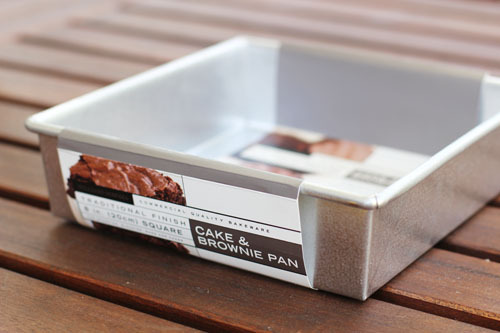 love the brownie/cake pan I need to get some new pans and bread pans. Now that I finally got a kitchen aid mixer for Christmas I’m a baking queen! congrats on your mixer – woohoo! Ooooh a WS outlet?! I must go someday! I’m still sad that they closed the Pottery Barn outlet in Lake Elsinore. I don’t use rubber gloves, but I do use disposable gloves (the vinyl exam gloves at Costco) for cleaning and also cooking with raw meat. Works great and I can just toss them after! the outlet is fun – things are that much cheaper than the store, but it’s still a great store! the disposable gloves would be much better for fine motor skills, that’s for sure! I loooove rubber gloves! I mainly started using them because my hands get so dry when I’m doing dishes/cleaning the kitchen. Dryness isn’t a problem anymore… I like the Playtex yellow ones found at WalMart or Target for like $2-$3. They are snug so I can still feel other surfaces, but not so snug that my circulation is cut off. And I don’t feel clumsy at all! I keep a stash under my sink even… Oh, and I definitely wear them when I’m cleaning bathroom! thanks for recommending the playtext gloves – will have to check them out. I love rubber gloves! I wear them when doing dishes and cleaning bathrooms. I buy the Kroger brand in the small size and they fit snugly! The snug fit is key! I don’t like to touch food remnants when doing dishes and it helps with my dry hands. I need to get snug gloves! I think that’s my problem! I only use rubber gloves for cleaning to keep the chemicals and germs off of my skin. Like Sara, I also use the disposable gloves from Costco. I hate touching raw meat so I use them whenever I have to handle raw meat. I also got burnt by peppers making salsa once so now I use them whenever I’m working with peppers too. I love the idea of rubber gloves. You can get the water really really hot, you don’t have to touch anything yucky. But I don’t like that I can’t feel as well. I do use them occasionally when they are new but (and this is going to be weird) once I have used them a couple of times, I get kind of squeamish when I go to put my hand in them, not sure why. So then I pitch them then a year or so later I buy new ones. Perhaps disposable gloves would be the solution? It could be that the picture is deceptive, but those gloves look huge! My guess is that you bought the rubber gloves with the cotton lining? Those gloves come in three different sizes. The small size is often the hardest to find. At the outlet near me, I’ve only ever seen the L/XL size. So…if you bought the L/XL size, then you might just be wearing a glove that’s way to big! Love rubber gloves! Sometimes I put hand cream on before I put them on and then do the dishes in super hot water and my hands feel fabulous when I’m done. I could never go back to not using them. I LOVE my rubber gloves. I buy them in bulk. It seems I always get a hole in right hand index finger. I save the “lefts”, just in case I ever get a hole in a left glove, then I will have a pair. It takes a little time to get use to them but then you cant live without them. I use gloves when doing the dishes because I have eczema but like the others I buy cheap yellow ones that last about a week, they are also good for protecting your nails if you do the dishes by hand. I have a pair of heavy-duty rubber gloves that hide under my kitchen sink but I think I’ve used them only a few times in all the years I’ve owned them, for jobs like staining or using heavy-duty chemicals that I didn’t want to get on my hands at all. Hate ’em. BUT, I’ve also gone to much more natural cleansers (primarily home-made) and my skin is much happier for it, as well. Even with my historically dry and eczema riddled hands – MUCH happier. And I feel your pain – a few weeks ago I accidentally put my big chopping knife through my finger – halfway through the nail and all, then the other day, chopped the pad of my pinky finger off with tongs. Who knew having to wear a band-aid would make me all thumbs? what “recipes” do you have for the natural cleansers – so curious! I’m firmly in the rubber glove camp. I seriously HATE to do dishes without them. But it’s probably because I used them while growing up helping with the dishes. I never have liked the rubber gloves. However I too don’t like handling meat and use disposable gloves. But, I use the clear plastic ones from Sam’s Club, instead of the vinyl exam type. They are specifically for use with food, and you may have seen food workers at a deli using them. The other time I always use them is when kneading the last of the flour into the bread dough. I hate bread dough under my nails. I’m a bit vinyl sensitive and I like the fact that they aren’t as tight as the exam glove type are, so my hands don’t get as sweaty. I love rubber gloves. I always thinking about getting a more expensive cute pair, but they get nasty inside so easily (at least with me – getting water inside, etc.) that I just buy the cheap yellow ones at Target or wherever that come 2 pairs in a pack. I use them for washing dishes all the time. I get grossed out easily by food all mushed up and going down the disposal, so this helps me get down and dirty without well, getting down and dirty. 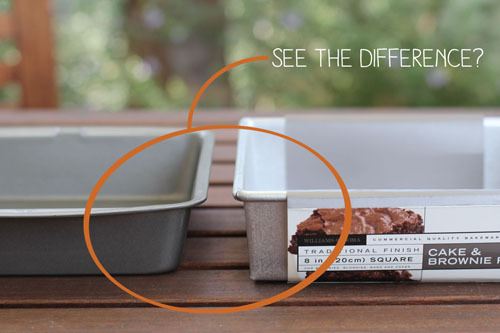 LOVE STRAIGHT EDEGE CAKE PANS! I never liked rubber gloves, but, lately I have been thinking I need to get a couple pairs. For dishes & for cleaning. My hands get sooo dry! I have seen pretty ones for several bucks & they have ones that go up pretty high, so there is no water spilling over the top. I feel like I can’t live without rubber gloves. I like to get the dish water super hot so I have to have rubber gloves to protect my skin. Plus, I just don’t like to touch the yucky water-logged food (gag). I get the cheap ones from the grocery store…probably Playtex (I don’t pay that much attention). They aren’t cotton lined, but I can get a small size that works well for my hands. Then if they’re cut, or one of the kids gets water inside I can just toss them and not feel too guilty. Like most of the other posts, I too use rubber gloves (Playtex) to wash dishes and clean bathrooms. I like to have my dish water super hot so the gloves are a must have for that. Also, I don’t think I could clean my bathrooms without using either rubber or disposable gloves. Between being a slight germaphob and a chemicalaphob, I just feel better cleaning with my hands covered. 🙂 I vote a big YES for rubber gloves! I love rubber gloves because I hate foam. And dishsoap is the foamiest of them all!! !